Are you suffering from the winter blahs like I am? Being cooped up in the house with no sunshine? My complexion has faded to this pale Casper white. I haven't had time to get to a tanning bed and I'm really kind of afraid of the damage they may cause my skin anyway, so I thought I'd give these Glow2Go Self Tanning Towelettes a try. I have the box of 20 single use towelettes. Just apply to clean dry skin, using sparingly around your elbows knees and ankles. Wait for about 10 minutes to get dressed to allow your skin to dry completely. You can use this daily until you have the desired result, then use once or twice a week to maintain your tan. With a great product like this on the market , there's no reason to go through the winter months looking pale and washed out. Now I can have a healthy sunkissed glow all year round. Speaking of having healthy looking skin, I have the perfect tool for getting rid of blackheads and blemishes. 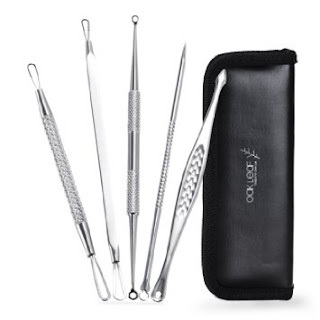 Blackhead Remover Kit by Oak Leaf is a 5 piece tool set made of dermotologist grade stainless steel, so you can remove blackheads and pimples without skin irritation that blackhead strips and squeezing can cause. All 5 tools are different sizes and shapes to accommodate whatever kind of blemish you may have, wherever it might be. Being made of high grade stainless steel these tools can be completely sanitized before and after use. It comes in a zippered case to keep your tools all together and easy to carry. I wish I would've had this set when I was a teenager!